Thug just released I'm Up, which means it's time to move on to the next project, Slime Season 3. He shared the album artwork yesterday, and unveiled a new video from the tape today. 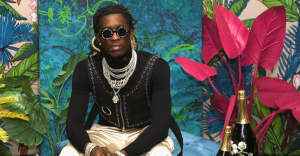 In the clip, Thug tumbles into bed with his real-life fiancée, Jerrika Karlae, and the couple paints a large heart on the wall of their apartment. The MC suggested on Instagram that the visual was appropriate for Valentine's Day. Be El Be directed the video, while London On Da Track produced the song. Watch above.